Abu Dhabi Taxis in the capital will soon sport ‘smart’ electronic signs on their roofs which will help commuters easily determine whether they are available for hire. 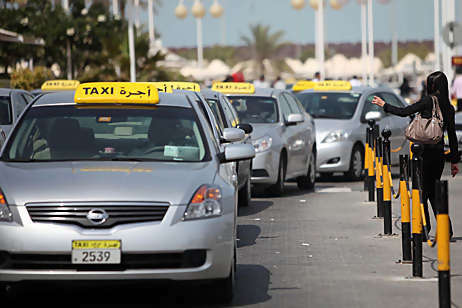 TransAD (The Centre for Regulation of Transport by Hire Cars in Abu Dhabi), the authority regulating taxis in the emirate, will test 30 roof signs on taxis soon, according to a press release. 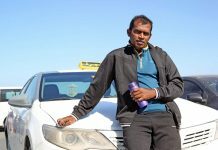 It is part of the authority’s strategic initiative to modernise taxi services. The new smart electronic roof sign has been designed with many features such as multiple fixed messages which are automatically triggered by the taxi meter or in-car computer or external optical inputs. It will display words such as ‘taxi’ and ‘vacant’ in green, or ‘hired’, ‘on call’ and ‘busy’ in red — in both English and Arabic with the option to automatically switch between the two languages. The new system offers the option of sending live messages from the dispatch centre to the taxi roof sign to display holiday greetings, booking number, and information in different languages. It also has automatic brightness adjustment for day and night. The features of the new system will enable potential passengers to identify if taxis are occupied from a distance. The availability of taxis can be gauged by an easily understood colour scheme of red, green and yellow. TransAD will test the new model by integrating it with the existing meter system (Mobile Data Terminal, or MDT) during the test phase. 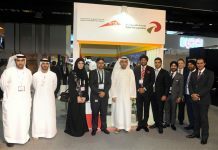 The smart electronic roof signs for the pilot project will be introduced in Abu Dhabi by September. TransAD is trying to ensure that the product performance during its pilot phase is adequate before going live given local weather conditions and other atmospheric elements.